There is no shame in admitting you have “Mom Stress”. The things moms are expected to do on a daily basis are mind boggling. Whether you are still in the diaper era, have graduated to the terrible twos or are running kids and sports equipment from one end of town (or country) to the other, you are understandably stressed. Here are fourteen dos and don’ts of combating mom stress. We all know that some of the stressful situations we find ourselves in could be avoided with proper planning. Maybe it’s as simple as starting a detailed calendaring system so you won’t miss snack day at school and have to run to the 24-hour Wal-Mart at 6:30AM to get a bag of apples… just sayin’. Maybe it’s doing a little ‘worst case scenario’ planning on a day you know you are going to be extra busy and aren’t sure if you are going to make it to school in time to pick up little Timmy. Or maybe it’s as simple as keeping a to-do list so nothing gets missed… re-work stinks and typically takes twice as long! I know this sounds like crazy talk to most moms: it’s quite possible you are simply over committed. Take a moment to truly examine your obligations. Make a list of them in order of priority. What’s the lowest thing on your list? Is it something you can either delegate or stop doing all together? You can also take a look at those top priority items and dig in a little bit to see what aspects of those are low priorities you can drop. In conjunctions with cutting back on your obligations, is developing the ability to say “no”. This covers the big things like agreeing to serve on the PTA when you know you don’t have that kind of time and the small things like saying “yes” to baking eight dozen cookies for the bake sale. In all honesty this could be a category of its own because moms have a REALLY hard time saying no which in turn adds to your already long list of obligations. There are just some things you can’t control… it stinks, I know, because I am one of those people who like to be in control of every situation. However, if you can recognize those times when you simply have no control and can say, “it is what it is”, you will be less stressed about what is happening. There’s nothing like a burst of endorphins to relieve stress. Whether it’s aerobic activity or weightlifting, both will kick the endorphins in high gear. If throwing on the leg-warmers and pumping iron aren’t your thing, consider taking a walk. Fresh air has restorative power and, for me, I always seem work out a solution to whatever problem I am having when I go for a walk. Don’t get me started! Mom stress is a vicious style. You are stressed so you can’t sleep then you wake up exhausted and it causes more stress. Just like you put little Timmy’s practice on your calendar, pencil in some “you time” and shut everything down at a decent hour. This is an easy one, right? You are breathing every minute of every day but are you breathing correctly? Stress relieving breaths are not your ordinary everyday breaths in and out to sustain life. They are deep breaths from the diaphragm. To make sure you are doing it right, lay down and place your hands just above your stomach but below your chest. You should feel your chest and above rising, not your stomach. I know this is kinda hinky to some but taking a few moments to center yourself could be just what the doctor ordered. If you have a hard time shutting your brain off, consider playing some soothing music (i.e., not Motley Crüe) or white noise such as crashing waves, a rushing creek or rain falling. Bring your mind to rest focusing on the sound and not the minutia flying through your head. Do you have pent up tension in your shoulders? That’s stress rearing its ugly head. Head to the nearest spa for a full body massage. If a full body massage isn’t your cup of tea just scheduling a deluxe mani-pedi will give your body time to relax as you let someone else pamper you for a while. Similar to a spa day, what about just taking a long hot bath utilizing your favorite aroma therapy candles? Now that’s relaxation… if you can get your hubby to keep the kiddos away for an hour or so. If you are a regular prayer you already know that spending time in prayer – no matter the length of time – will always reduce your stress levels. If not, it might be hard to figure out where to start. It can be as simple as “saying your prayers” before bed. Our bedtime routine includes saying the “Now I Lay Me Down to Sleep”, “Our Father” and giving God’s blessing to all who lay on our heart. For those looking for a little more structure, there is a free Bible app for Android and iPhone which has some wonderful, searchable ‘plans’. To find a plan, search for a topic that interests you. They have plans on everything from love to anxiety to healing and peace. There is even some specifically related to dealing with stress. Once you have chosen a plan, each day you will open your app and they will have a selection of bible verses or devotions related to your topic. These plans typically only take 5 – 10 minutes a day and really do leave you feeling spiritually refreshed. Notice I didn’t specify who you should talk to. Honestly, talking to ANYONE will likely reduce some amount of stress. The ‘who’ matters less than the actually talking. Some possible folks to talk to are spouse, parents, friends, co-workers, clergy and even a therapist. Just as there are absolute remedies to relieve stress, there are also absolutely Nos. The “nos” will not only NOT reduce your stress level, they will likely increase it. While you might think drinking a bottle of wine is going to “take the edge off”, but guess what? When you sober up that problem causing you the stress will still be there and now you are going to have to deal with it with a hangover. Not fun! Signs you are ignoring the stress include avoiding social interactions, constant over-sleeping, procrastinating, filling up every waking moment of the day and disregarding the root cause of the stress. Sure, it’s fine to escape to a funny movie for two hours but it’s not ok to not pay your bills because you are uncertain about your financial situation. Another vicious cycle here. You eat because you are stressed which causes you to gain weight which increases your stress. If you feel yourself headed to the fridge to eat your frustration grab a bottle of water, go for a walk, learn how to do needle work. And if you absolutely must eat… make sure to have some nutritious snacks at your disposal. Trust me, if you are stressed and your only option is to go for the gallon of Moose Tracks Ice Cream that’s what you are going to do but if you also have a bag of oranges at least you have a healthier option. People get stressed. I get it. But in no way, does that give someone the right to lash out at another person or family member or throw a temper tantrum or even resort to physical violence. 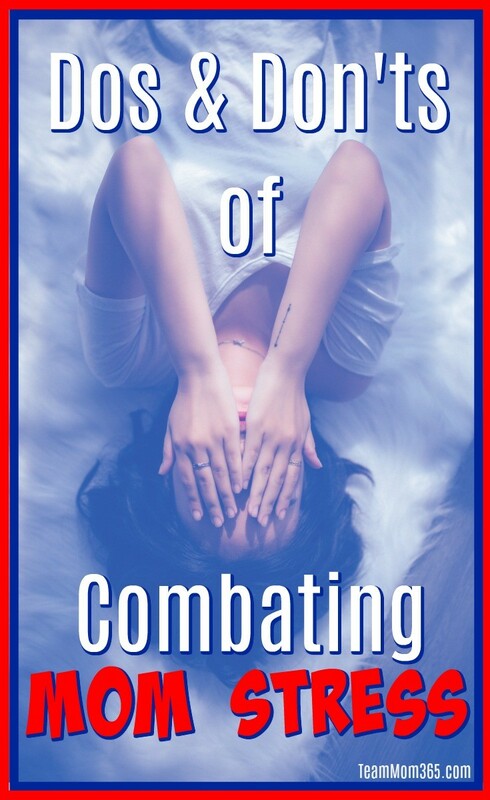 If you feel yourself on the verge of one of these scenarios remove yourself IMMEDIATELY… it will be better for you… and potentially your criminal record. These are great tips, especially the planning ahead. It’s hard to do when things are crazy already, but it can make such a difference in how the days go. When we’re behind, and winging it around here, it really shows (and not in a good way!). So true! It’s hard to plan ahead but so much better when it’s done. Exercising is a big one for me! Even though I’m lazy sometimes that little 1 hr does a whole lot of difference in my mood. Great post! Thank you! I love exercise too. As a former Jazzercise instructor, I completely understand what you mean about having a different mood when the workout it over. Cutting back on obligations can be difficult when you want to please everyone. I have gotten better about not saying, “Yes,” to everything, which is a start. It’s so hard! My head knows to say “no” because I don’t have the time, my heart says, “of course you can, you are free from 12:00am – 2:00am”. So glad I could help. I have also needed every one of these stress relievers at least once!! All of your tips are spot on! Thank you for this. 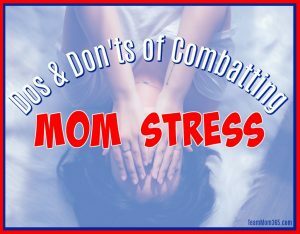 We have to understand that “mom stress” is normal and try to minimize it as much as possible. So true! Proactive management of “Mom stress” is way easier than reactive management. I’m not a mom but I think everyone can use some stress relieving tips! « A Hurricane is Coming to Disney! What to Do!